Discussion in 'Sailboats' started by Abe Shaffer, Sep 7, 2017. Hi Penny, welcome to the forum . .
Is this the boat . . . ? This is our boat Apostle at the Blackbeard Festival. It is not for sale. 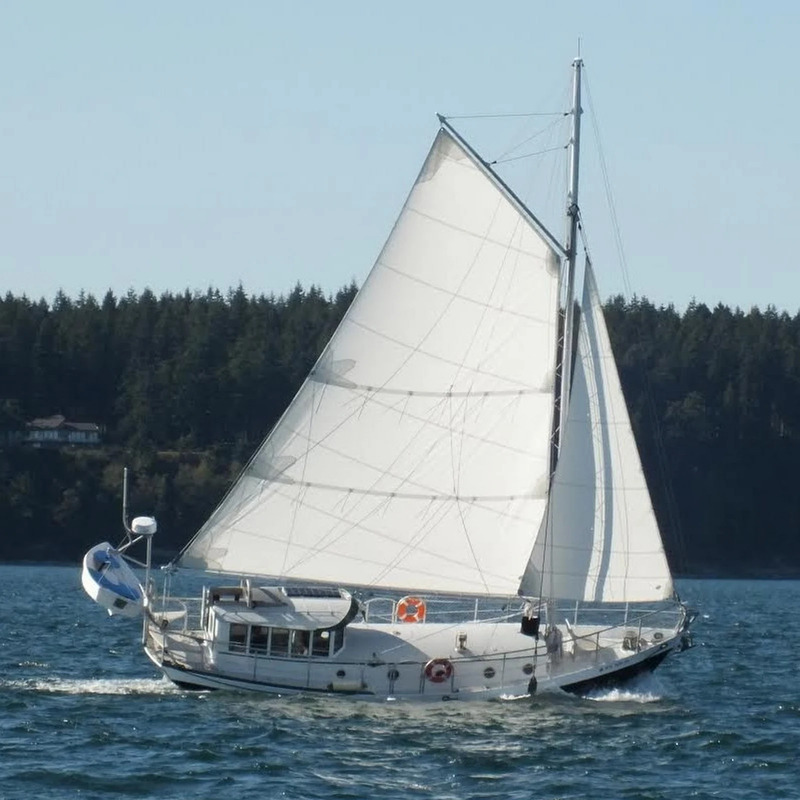 Cargo Schooner Antelope is for sale. Yes, it was the last boat he built and owned. Where does one find small cargo loads to haul across oceans? The boat is capable to do so, but nowhere in the provided info it says anything about the intention to haul the 10 tons cargo capacity across oceans, think about small distances along the coast and between islands to pay for some of the costs while cruising, or earn just enough for a simple living on board a bit bigger boat. Maybe Tom's family is willing to sell plans for that, also look e.g. at Tad Roberts¹ and Dudley Dix² for their plans. Check out Fair Transport how to set up a business in this field, and see Green Cargo and French Wines Sail Again for some inspiration. But, if you can't figure it out without me telling how, then best don't start such a business. Like Tom, George has gone ahead of us, maybe Susan and Gail keep the office running . . ? SV Panope, an aluminum built ± 34' LOD Colvin Saugeen Witch* gaff sloop, with a pilot house instead of a cockpit, which usually sails in the PNW. * Wayback Machine link to Tom's moderate displacement ocean sailing designs, since Tom's R.I.P. own website is offline since a while now. Hi Penny. I built one of Tom's SAUGEEN WITCH hulls stretched to 38'. Took a while but I wasn't in a hurry. Tom did supply me with the rigging plan and interior arrangement for ANTELOPE but not the lines & offsets because he said they weren't really up to the standard he'd be happy selling. I always wanted a set anyway. At 65 I doubt I'll build another boat from scratch but - who knows. If I did, it'd be ANTELOPE, I just live the lines. So - if your family would be willing to sell a set of drawings, I'd be happy to buy them. A few photos of my hull in the shed. Some odds & ends still untidy, but done. I used Tom's book to sew the junk sails. Fair bit of work but no dramas. Tom knew what he was doing all right. bajansailor and Angélique like this. Hi Penny. I built one of Tom's SAUGEEN WITCH hulls stretched to 38'. Hailing all sea folk with an appreciation of the elegant designs of Thomas Colvin! I am trying to find a set of plans or a completed hull for one of Thomas Colvin's cargo schooners for a fledgling sail cargo project. Can anyone help me to find plans or a boat builder who has made and can make a Colvin boat? Very much appreciated! Abe, I captained and sailed Mr. Colvin's "Cheif Aptakisic" from 1975 to 1978. She was the first of what was intended to be a fleet of trading schooners to operate in the South Pacific Islands. Unfortunately, the project never matured and the idea was scuttled. As ship captain for Sea Explorer Ship 8 of the Boy Scouts of America we rebuilt the Aptakisic and sailed her in the Bicentiaal Tall Ship Parade New York Harbor 1976. I have quite of information about her, her design and her hull lines. We logged Just over 5000 miles in 100 days. As far as the design is concerned, the Aptakisic did very well both onshore and offshore. Our longest passage was 10 days and the max wind speed we encountered was around 35 knots with 10 to 15-foot waves. From your description of the boat criteria, I think the Aptakisic class would do well. Mr. Colvan designed the boat in both wood and in Ferro cement. I don't think it was designed in either steel or fiberglass. I am willing to send you all the information I have for the cost of mailing and a little more for the effort. Very interested by all I read and the quality of Angelique's repply, I am also interested to get some more information from GHB about the boat. Thanks Deciates, and welcome to the forum . .